The Dutch Book Staking Plan takes the worry out of betting and can be used on any TAB meeting. The Dutch Book method is a well tried staking approach and is nothing new...But why use something new if the old approach still works? The Dutch book is a great way to support multiple runners to collect the same amount whichever runner wins with the program giving you the option to see how much to bet, potential profit and betting choices. Basically the approach is to support 1, 2 or more runners to collect the same amount in one race. If one of the runners wins, then a nice profit margin can be made. Betting to collect a fixed amount not only increases your potential profit but also reduces losses. For the $5 chance, $20 must be wagered to return $100 ($80 profit + $20 stake returned). The overall bet may prove to be a poor wager (outlay $78 to return $100) or a sound investment, depending on the number of chances in the race, race conditions and so on. The program shows the percentage outlay on the race so you can decide whether to bet or not. The Dutch Book program calculates the amount to bet on each runner according to the odds provided. In this way, selecting the winner will return the same amount no matter which horse wins (or can be used with overlays for even greater potential profit). 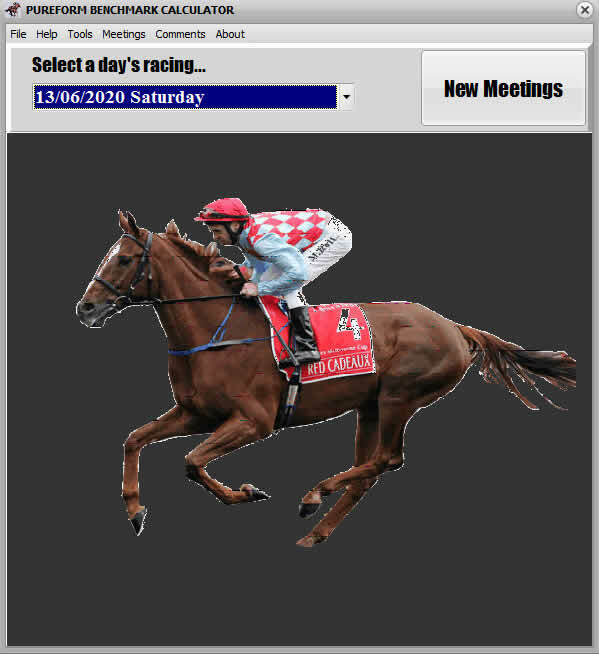 Before the day's betting begins, click the Create Fields button to download all the TAB meetings for the day. Depending on your Internet speed, the fields will be ready to use in a few moments. Click the 100% button to adjust the market to 100%. Basically the TAB market is set to around 115 to 120% and so the odds can be misleading. Setting the market to 100% ensures your maximum options. Why use the TAB market if you have your own opinion. 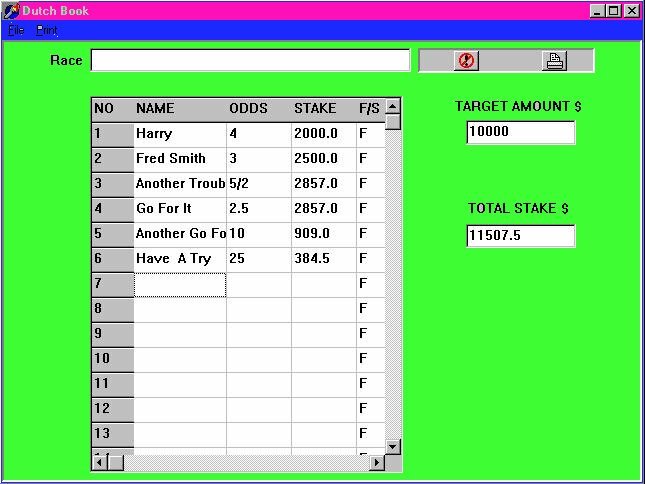 Simply type the odds that you require into the odds box for each runner, set to 100% (or not) and voila! the bet amounts are ready. The bets are set out in a NSW or VIC TAB format to use the Expert Mode to submit each wager. All bets can be placed in one transaction using the Expert Mode batch process. Simply click the Copy button on the program then paste the bets into the batch area ad submit. It's easy after a couple of tries. The copy and paste process also gives you a few seconds to consider your bets before they are placed. It is a very powerful staking program.